Which of the following molecules corresponds to 2-bromo-1-chloro-4-propylbenzene? Aromatic compounds are named as derivatives of benzene. 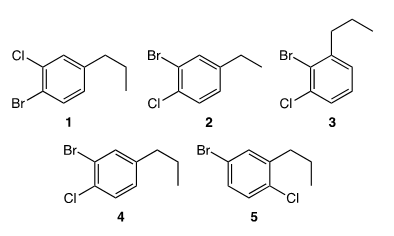 Substituents positions are indicated by numbers except that o- (ortho), m- (meta) and p- (para) may be used in place of 1,2-, 1,3-, and 1,4-, respectively, when only two substituents are present. If alkyl substituents are smaller than the ring (6 or fewer carbons), the compound is considered an alkyl substituted benzene. Alkyl substituents larger than the ring (7 or more carbons), are phenyl-substituted alkanes. Compounds are named by numbering the position of each so that the lowest possible numbers are used. The substituents are listed alphabetically when writing the name. Which conformation of 1,2-dichloroethane has a zero dipole moment? The carbon-chlorine bonds are polar due to the difference in electronegativities of C (2.55) and Cl (3.16) atoms. These individual dipole moments cancel each other out only in an anti-periplanar arrangement (compound III). 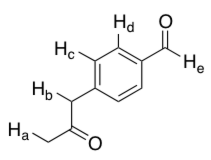 Which of the following compounds gives 3-methyl-2-butanol upon reduction with LiAlH4? LiAlH4 is a strong reducing agent of carbonyl compounds. 3-methyl-2-butanol is a secondary alcohol, therefore, reduction of a ketone is required for its preparation. 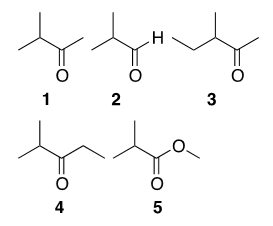 Which labeled proton in the following molecule is most acidic? structures that can be drawn) the stronger the acid. Proton Hb is most acidic due to the charge (and lone pair of electrons) on the conjugate base being delocalized over both carbonyl groups and the benzene ring. Which is the best leaving group in a substitution reaction of an alkyl halide from the following choices? As size increases, basicity decreases, meaning a species will be less likely to act as a base; that is, the species will be less likely to share its electrons. Iodine is the largest in the series. Quinine is well-known antimalarial drug from the bark of the cinchona tree. In principle, how many stereoisomers of quinine are possible? Quinine has four centers of chirality (highlighted with asterisks). Thus, in principle, quinine has 24 (2 x 2 x 2 x 2 = 16) stereoisomers.